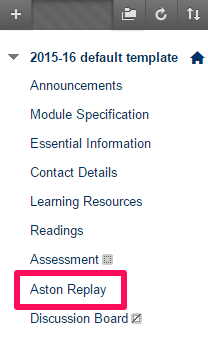 Before you record anything for your module, you’ll need to provision the Blackboard course with Aston Replay. This gives you somewhere to record to, and makes sure that only the students on the module can see what you record. Go to the Blackboard course you want to record sessions for. All schools now have a link to Aston Replay in the course menu – so click it and skip to step #8. If you need to add it to the course, read on. Make it available to users Note this refers to the link in the course menu, not the availability of any sessions you record into the Panopto folder. This will create a folder on Aston Replay for this Blackboard course – any instructor or TA will be able to record sessions the folder, and students enrolled on this course will be able to view those sessions. Clicking OK on this screen takes you to the Select Panopto Folders screen which lets you manage which of your Panopto folders will be available to students in this course. If you have Panopto content you wish to reuse in this course, you can follow the steps. There are two ways students can download your sessions. However, if you want to give your students the ability to download the session when they’re viewing it, you can switch that feature on by following these steps.